Wallets are things that most people don’t spend too much time thinking about. I’m not gathering any statistics here, but I would bet that the average dude couldn’t tell you that much about the wallet he has in his pocket other than that it has pockets, it holds cards, its made out of (real?) leather, and it contains less money than you wish it did. A little while ago I spent a lot of time thinking about wallets, spurred on by posts on 43folders and 37signals. My wallets dimensions were growing increasingly George Costanza-esque and that bulge in my pants had nothing to do with the fact that I was happy to see you. Let’s get some facts straight here – I am by no means a very fashionable dude. My selection of clothing is always function and comfort over form. So the fact that my wallet was very plainly visible in my un-tight jeans, meant that something wasn’t working. I had always toyed with the idea of buying (or fashioning) some sort of money clip, but the fact that I used my debit cards way more than I had cash in my pocket precluded that. In comes the Jimi. After seeing that they had released one in black (not that there’s anything wrong with translucent pink), I forked over the 15$ and figured I’d give it a try. After more than two months, I have to say I’m very happy about the purchase. Its small – and I mean really small. Its really lightweight – my old wallet was always full of change that I could never access and therefore always weighed a ton. 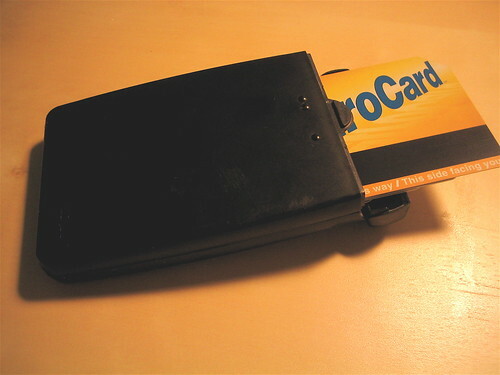 I can get my metrocard out without taking it out of my pocket. Living in NYC this is a real killer feature. Who wants to take their entire wallet out at a subway entrance? Not just for safety but for general speed as well. It feels a little flimsy, like I could break it really easily. It is plastic after all, and the fact that its less plastic, makes it lighter and smaller. Though something tells me it wont last more than a year. The snapping hatch at the top is my bet on the first thing to break. I haven’t figured out how to fold the bills properly. This might be more of a learning how to use a money clip issue, but I always have to pull out all the bills to get to that single dollar i need for my morning coffee. It gets scratched really easily. My pockets are places of great danger for anything remotely damageable. With razor sharp keys, pens, and the occasional pennies, anything caught in my pocket unarmed is sure to get a good thrashing. Jimi got beat up pretty quick, but since its all black you can only really see the scratches in certain light. I wish it had some rubber insets so it would stay on a table/in my pocket. Without the leathery friction, I’m always scared that Jimi is just going to fly out of some of my looser pockets. A little inset strip of silicon on each side would do the trick of gripping it nicely. These complaints aren’t very big. I’m inclined to recommend a Jimi to any one with a Costanza wallet that their just plain sick of. The constraint of only being able to carry a certain amount of cards is actually pretty freeing. 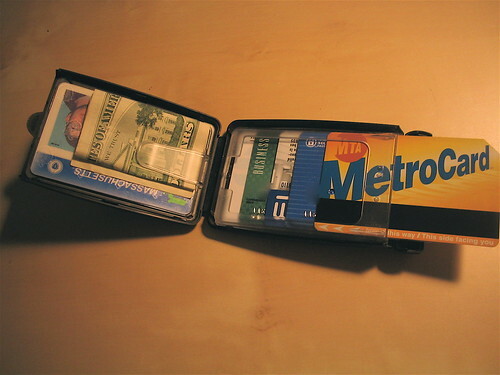 (Note: It holds 4 cards on one side, plus 1 behind the money clip, but I’m also able to fit my metro card on top of the 4 cards without issue). I’m forced to think about what I really need to bring with me, and 99% of the time I realize I don’t need much more than my Metrocard, my debit card, and my drivers license. Yeah, I’ve been kicking around with a wallet from JCrew that has two pouches: one for cards and the other for cash. it stays pretty slim and it’s easy to get stuff out of. interestingly enough, the last great wallet i had (acutually still has an AQ sticker on it) was from JCrew also, and that was their version of the magic wallet, which is super function and fun to play with. I’m going to give the Jimi until it breaks (at least) and then maybe look into one with similar function, but a little more style.